HONG KONG -- Five women scientists will receive the rare honor of being immortalized as inch-tall plastic figures with claws for hands. Lego announced Tuesday that a new set will feature some of the pioneering women who played vital but sometimes under-appreciated roles in the U.S. space program. The figures have been commissioned under the toy maker's Lego Ideas series that allows fans to propose concepts for new sets. The "Women of NASA" set was designed by science writer Maia Weinstock, the deputy editor of MIT News, and pitched with the headline "Ladies rock outer space!" 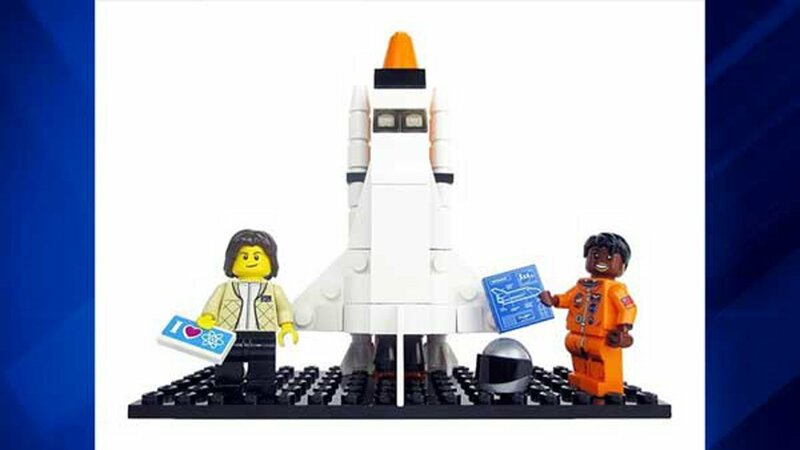 The "Women of NASA" Lego set was designed by science writer Maia Weinstock, the deputy editor of MIT News, and pitched with the headline "Ladies rock outer space!" Among Weinstock's figures are Sally Ride, the first American woman in space; Nancy Grace Roman, who's known as the "mother" of the Hubble Space Telescope; and Mae Jemison, the first African-American woman in space. Also included are Margaret Hamilton and Katherine Johnson, whose work helped put the first people on the moon. Weinstock said the set celebrates the NASA scientists' careers and "provides an educational building experience to help young ones and adults alike learn about the history of women" in science and technology. Lego has been criticized in the past for a lack of professional female characters, most famously in a letter from a 7-year-old fan in 2014. "All the girls did was sit at home, go to bed and shop, and they had no jobs but the boys went on adventures, worked, saved people," Charlotte Benjamin wrote. In response, Lego released a limited edition "Research Institute" set designed by geophysicist Ellen Kooijman that featured three female scientists -- a paleontologist, an astronomer and a chemist. Lego said it's still figuring out the final design and price for the "Women of NASA" set. It's planning to release it late this year or early in 2018. But it's not clear if it will be a limited edition set like the "Research Institute."